Planning an awesome party–whether it’s for preschoolers, high-schoolers or over-the-hillers–comes down to one thing: ingenuity. Paraclete XP Indoor Skydiving has been helping folks blow out the candles in a most delightful way since 2008, so our crowd-pleasing expertise is pretty much unparalleled. We’ve learned a lot from the parents (and other party-throwers) who have celebrated with us over those years, and we’re excited to share that wealth of knowledge with you. So, without further ado: Here’s a guide that will help you visualize–and prepare for–what’s bound to be a landmark indoor skydiving birthday celebration. A: The short answer is that Paraclete XP provides the opportunity for you and your guests to experience something extraordinary; to make a rock-solid memory that’ll last a lifetime! Over the course of these years, we’ve learned over and over from our partiers that the experience IS the thing. It’s not about all the frills–fancy food; favors; decorations; etc. It’s about the flying–sharing together in something totally new and wildly exciting. 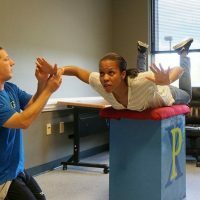 To be specific about it: Each indoor skydiving party package includes flight time, personalized flight certificates for every guest, classroom training, flight gear, and a flash drive that contains the party’s flight video. Depending on the package you choose, we also have a private party room available (additional details below). Q: How Much Does An Indoor Skydiving Birthday Party Cost At Paraclete XP? Pricing, as you might imagine, depends on which package you choose, and the size of the group. Check out the grid on our indoor skydiving birthday party page for our standard party packages. 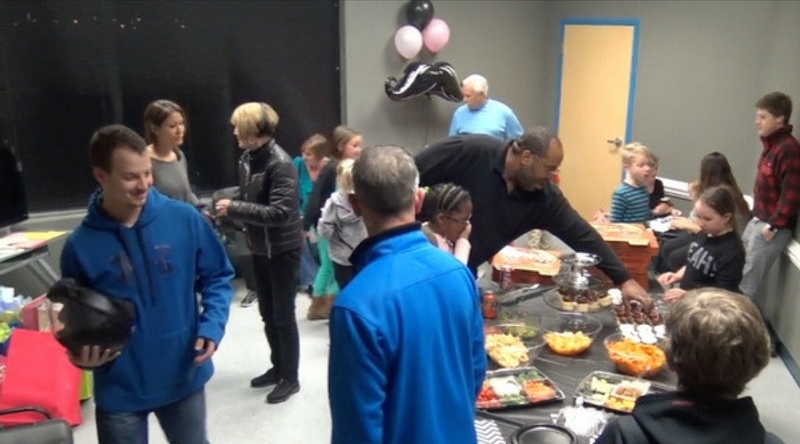 An indoor skydiving birthday shindig costs roughly $50 per participant. If the number of guests in your group doesn’t fall into one of our standard packages, give us a call and we’ll see what we can do to accommodate you. If you’re not exactly sure of your numbers, we recommend the “Ultimate” Party Package which will allow enough flying time to keep you covered. Indoor skydiving is a uniquely accessible adventure. Ages three and up can fly! Our age and health requirements are posted right here on the FAQ. Q: What Should I Expect As Far As Itinerary? You, the party planner, arrive on-site and check in at the front desk. You and your guests will complete your pre-flight training. Training will either be conducted with the entire group at once or broken up in smaller cohorts, depending on the size of the party. You and your guests will get geared up in your jumpsuits, helmets and goggles. You and your guests will fly! Your total purchased flight time can be allocated however you would like. You can split the time evenly among guests or give the guest of honor a little extra time to fly.You and your guests will party! If you’ve booked time in the party room, you’ll gear down and go to the party room for food and cake–and to watch the video, of course! Q: How Much Time Should I Plan To Be On-site? A: That depends on the package that you book. For the 24-minute party package (6-12 flyers), guests typically spend two hours for the activity and one hour in the party room. For the 48-minute party package (12-24 flyers), guests typically spend four hours total on-site which includes one hour in the party room. Q: When Do I Have To Confirm The Number Of Guests Attending? 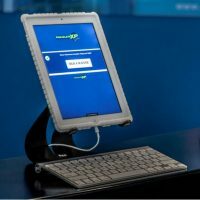 You’ll select a package upfront with a set amount of “flight minutes.” Conveniently, Paraclete XP does not require a final guest count; the total flight time will be split up however you like across the group. If more people show up, you can expect a little less flight time per person; if more people show up, vice versa. You can purchase additional flight time the day of the party if it is available. The majority of time, we are fully booked on weekends, so we highly recommend selecting a package with plenty of flight time to accommodate your group. Q: What Should I Tell My Guests To Wear? …To Bring? We recommend that your guests wear comfortable clothing and sports shoes that lace up firmly. If a guest has hair that’s long enough to put in a ponytail, they should bring along a hair tie. If you’re hosting a party for minors, make sure that each child brings a completed, signed waiver from his/her parent or legal guardian. Only waivers signed by the child’s parent or legal guardian may be accepted. The child won’t be able to fly without it, and we don’t want any sad kids at the party! Paraclete XP will provide the jumpsuits, goggles and helmets. If, for some reason, a guest forgets to wear sports shoes that lace up firmly, we can provide them. No socks are available, however–so it’s a good idea to bring an extra couple of pairs to cover forgetful guests. Q: How Does Paraclete XP Handle Waivers? A minor must have our waiver signed by a parent or legal guardian in order to fly. The signatory parent or legal guardian does not have to be present. The parent/legal guardian can conveniently download the waiver from our website and send it along with the minor. Please note that the notary is not required. Very frequently, a child will arrive without a waiver but with, for example, an Uncle or Grandma who will then try to sign the waiver. Unfortunately, this is not acceptable. The waiver must be signed by a parent or legal guardian. Q: How Does The Party Room Work? Pro tip: As it turns out, people only spend a little bit of time in the party room. They want to be out in the observation area; they’re transfixed by the other fliers. The room rental is $50 per hour. If you’d like to stay in the room for an extra hour, you’re welcome to pay the extra (subject to availability). Q: What’s The Party Room Like? The party room comes equipped with tables and chairs and a monitor for video-viewing. Group size for the party room is ideally 10-25, as the space comfortably fits a maximum of 25 people. There are tables directly outside of the room where you can set out additional food, and there’s a side table inside the room for drinks (and cake!). Q: Can I Get Into The Party Room Ahead Of Time To Decorate? We love to get all Martha Stewart, too, but listen up: In all the years we’ve been doing this, the best advice we can give you is not to go overboard on decorations. A couple of balloons help to set the mood, but partygoers just don’t spend enough time in the room to warrant it. Q: What Do People Usually Do For Food? No food is available directly from Paraclete XP, but there are several options you can reach out to directly for catering. Pizza: Most party planners go the classic route and order pizza, delivered right to the party room. Papa John’s, Marco’s Pizza and Dominos are all close by options. Sandwiches: Both nearby locations of Jersey Mike’s and Subway can create catering spreads. PKs Grill & Pub: For a fancier spread, you’re welcome to order from Skydive Paraclete XP’s on-site restaurant. Contact the restaurant through their Facebook page for more information. Please note that Paraclete XP does not have a refrigerator or freezer on-site to store cake or ice cream, so we recommend bringing desserts and snacks that do not need to be kept cool. Guests are allowed to bring snacks with them to the flight deck, however, we prefer that people eat their meal in the party room. Q: Does Paraclete Offer Invitations? Q: What’s Necessary To Bring That I Might Forget? No one shall be allowed, at any time, to fly under the influence of drugs or alcohol–so no drinking before flying. Alcohol, however, is allowed in the party room for persons over the legal drinking age, post-flying–so you can feel free to toast that milestone birthday. To avoid any awkward moments, please call ahead to check with Paraclete XP on alcohol standards before you bring alcoholic beverages on site. 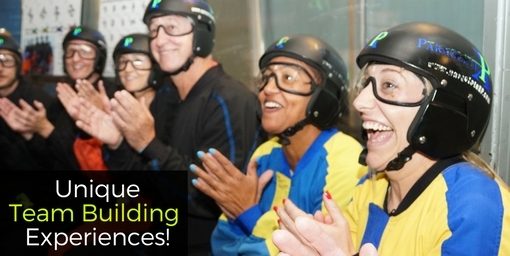 Ready to plan the ultimate indoor skydiving party? Contact us with any questions you have or book your party today with Paraclete XP Indoor Skydiving!